The Whereabouts team is honored and delighted to be working with Fifth Season Cooperative to help connect healthy local farms with colleges, hospitals, and corporations within 150 miles of Viroqua, Wisconsin. This work is especially satisfying to me, after getting a recent look at the food that’s being served in some hospitals. My mother had to be hospitalized several times over the past two years, and I was not thrilled with what I saw on her meal trays – syrupy fruit cocktails, saltine crackers, goopy soups, and applesauce – all highly processed and loaded with sugar, among other evils. The hospitals are not entirely to blame for this state of affairs. The reality is that our food system is like a network of big pipelines, and the organizations that buy the most food get it delivered through the biggest pipe – with agribusiness giants filling the pipe from the other end. Things are highly automated and efficiency is great. Unfortunately, the system doesn’t allow for variables such as seasonal freshness and local sourcing which offer superior nutrition and both environmental and economic benefits. Now, thanks to Fifth Season Cooperative, the institutions within 150 miles of Viroqua have a new option – a secondary pipeline with a single point of contact to an amazing network of family farms offering the best foods of the season. Several leading organizations in the region, including one major hospital network, have already signed on and are actively engaged in the Fifth Season system. What a boon for our area! Not only do the people in our hospitals, colleges, and corporations get to eat more nutritious foods. The entire community benefits from the fact that the local economy is fueled by this business. The farmers will be able to keep farming, and they’ll spend some of their earnings in the rural communities where they live. Even better, Fifth Season farmers must abide by the co-op’s tough sustainable farming policies. That means they’re being paid to farm in a way that protects us all by nurturing soil and protecting air and water. Fifth Season operates with a unique cooperative model in which producers, processors, workers, distributors, and buyers all receive fair pricing, transparent information access, quality assurance, and a voice in the co-op’s business direction. Some of the members are other producer co-ops, too. Best of all, they’re catering to the smaller markets that are typically bypassed by today’s food distribution system. What a great model for America – a regional food distribution system! With Fifth Season selling directly to regional institutions, I won’t be surprised to see better food at some of those places sooner that we’ll see it in their big city peers’ institutions. 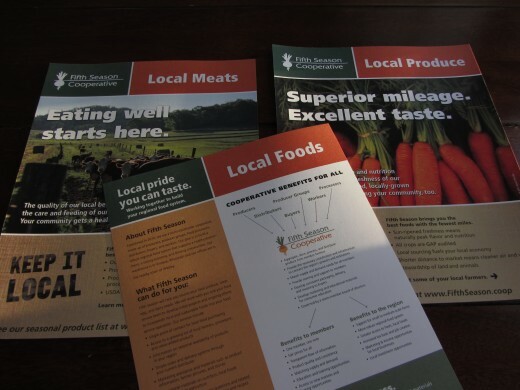 The establishment of Fifth Season Cooperative was supported by Wisconsin’s “Buy Local Buy Wisconsin” grant and the Vernon Economic Development Association (VEDA) – both with great local business strategies. Thanks and congratulations to Sue Noble, Executive Director of VEDA, for leading the charge!